Also known as Su Shi, Su Tung P’o (1037-1101) was a Song Dynasty writer, calligrapher, painter, poet, statesman and noted gourmet. The dish “dungpo pork” is named for him. The red, waxy tips on the Bohemian Waxwings’ wings are actually flattened feather shafts. 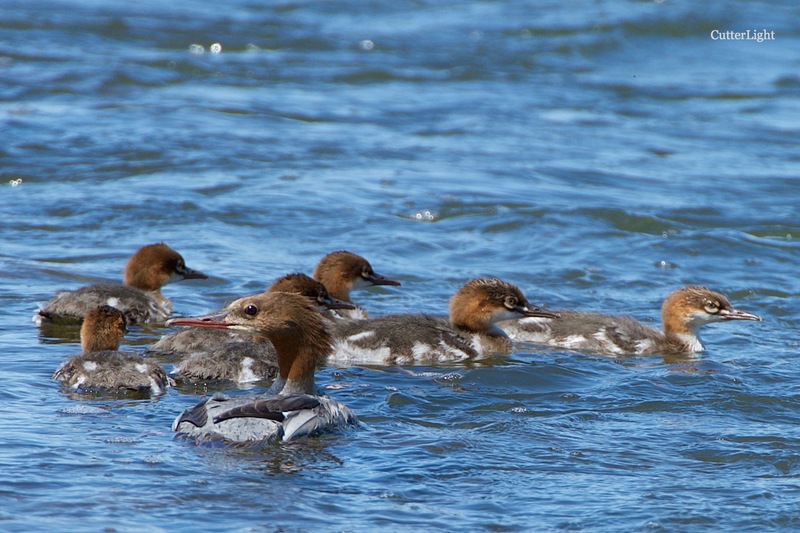 A healthy family of common mergansers (Mergus merganser) indicates an abundance of small fish in the Tuul River on the outskirts of Ulaanbaatar, Mongolia. 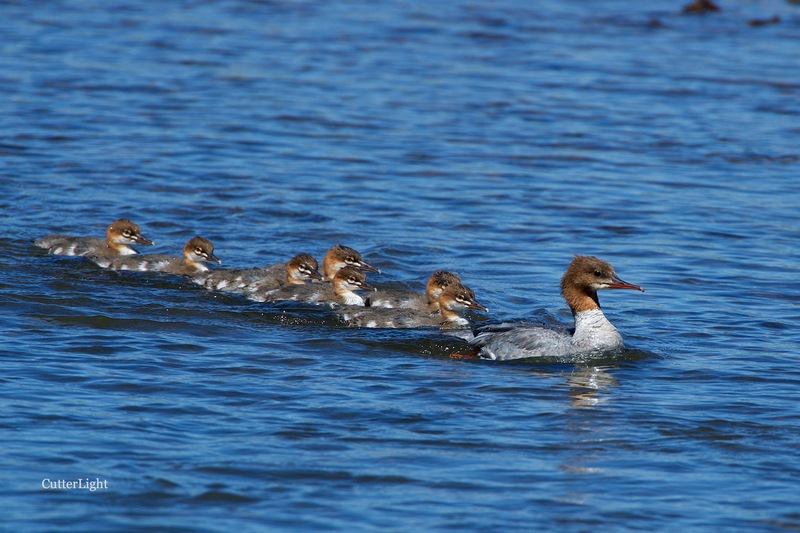 Mergansers are large diving ducks that subsist primarily on fish, although the young also fill up on aquatic insects such a the larva of mayflies and stoneflies. They make their nests in cavities in trees, sometimes a good distance from water. Less frequently, mergansers nest in holes in cliffs or high banks. They can be found on open water throughout the Northern Hemisphere, and are a good indicator of clean water and healthy populations of small fish. If you look closely, you can make out the serrations on her bill – the perfect adaptation for holding onto fish. In contrast to the females, the drakes’ heads are dark green, their flanks are white and their backs are black. 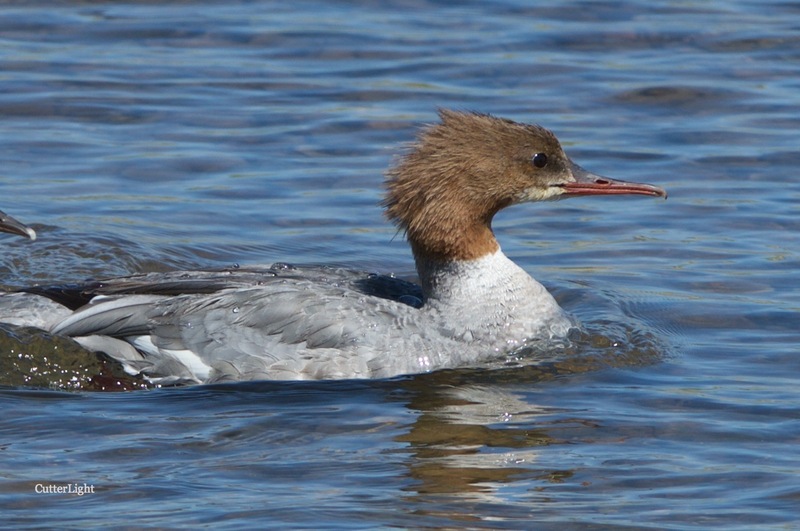 Although common mergansers are usually encountered on freshwater lakes and rivers, they are frequently seen in coastal bays and estuaries as well. A baleful eye tells us we’ve approached close enough. Undisturbed this family went about their business, dipping their heads underwater in search of food as they paddled along the river’s current breaks. Looking almost like exquisite mounts in a museum diorama, these Willow ptarmigan (Lagopus lagopus) proved to be quite approachable. 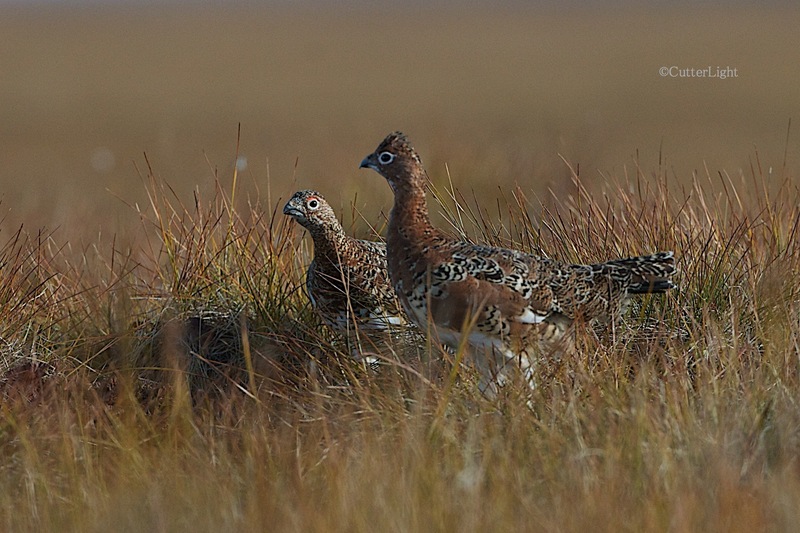 While hiking on the tundra near Point Hope in September we came across two coveys totaling about 20 birds. 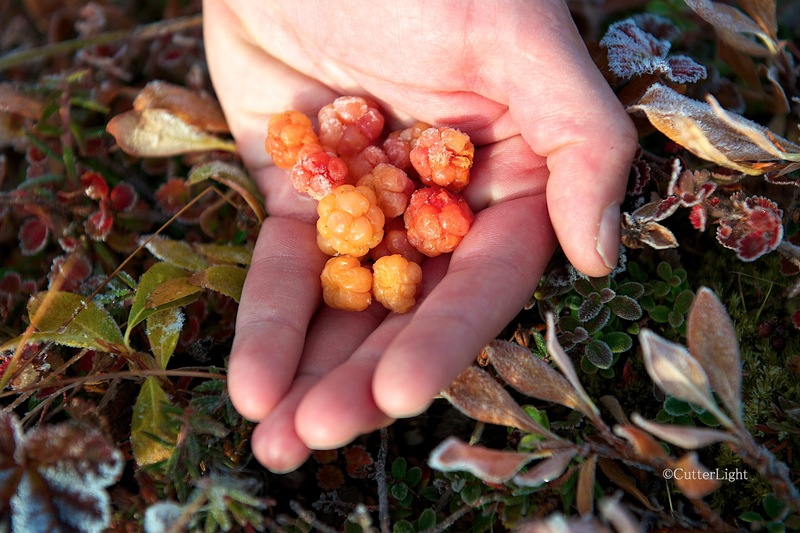 Nipped with frost, these cloudberries tasted like sorbet and were no doubt what had drawn the ptarmigan. 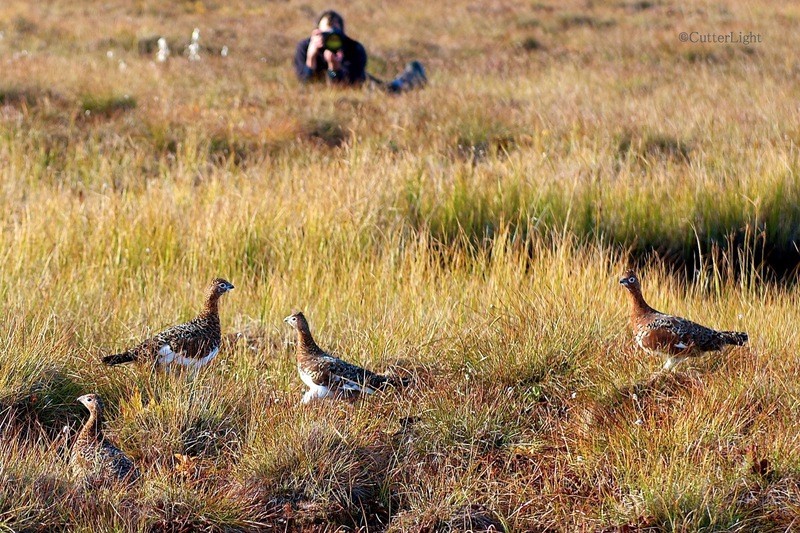 Barbra cautiously approached the birds as I lay on my stomach, inching through the boggy terrain, shooting, hoping a few shots might come out. The plumage of these fall birds is in transition from the mottled browns and reds of summer to the snow white of winter. 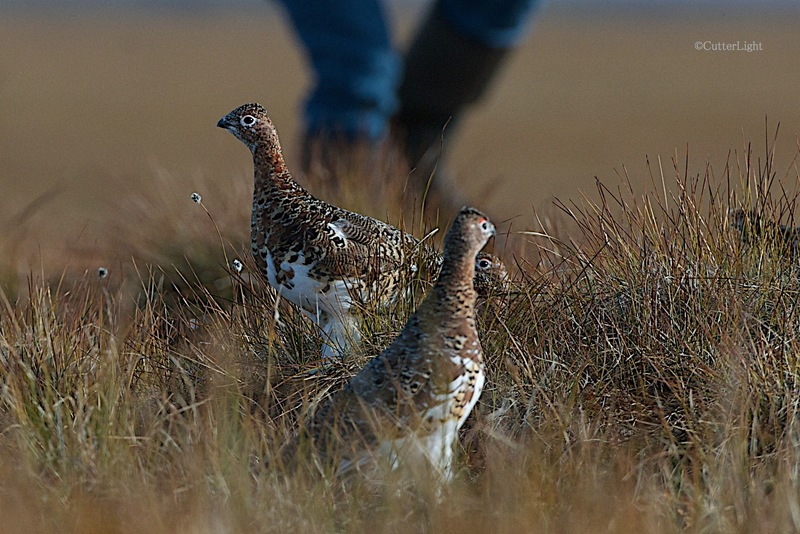 These are the same species as the red grouse of Scotland. Barbra crouches and stalks closer to the birds. Note the densely feathered legs. 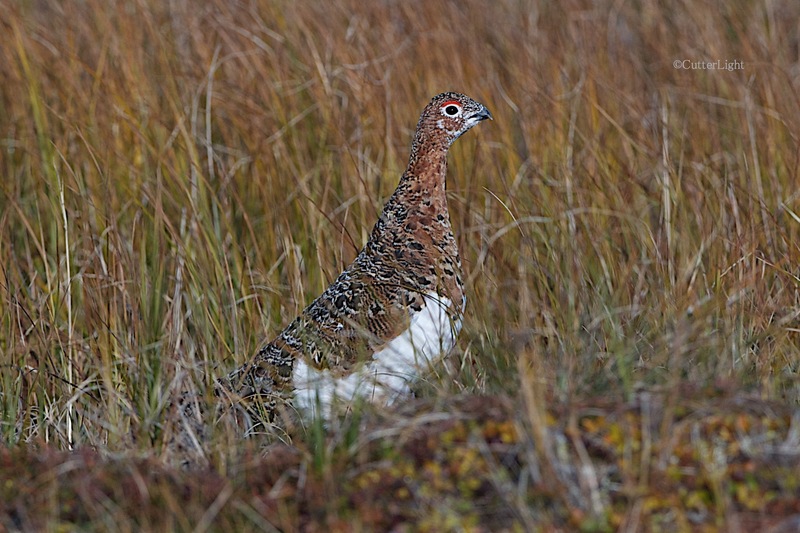 The Latin lagopus translates to “hare foot” for the resemblance of ptarmigans’ feather-covered legs and feet to those of snowshoe hares. 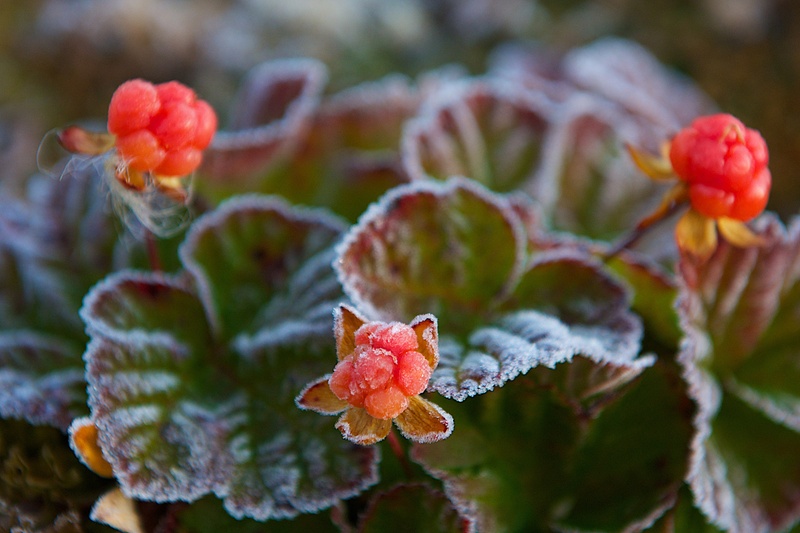 There’s always evidence of a rich ecosystem on the Arctic tundra. 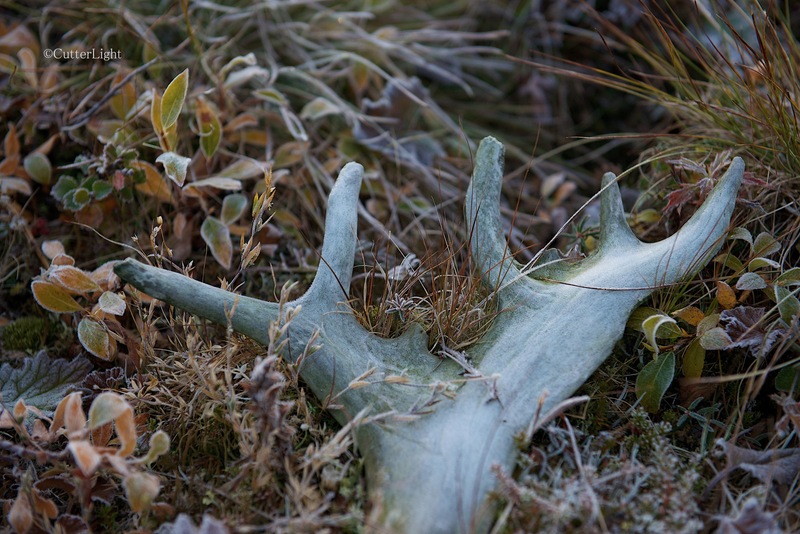 Caribou antlers, bird nests, animal burrows and an amazing array of plants are part of our walks. 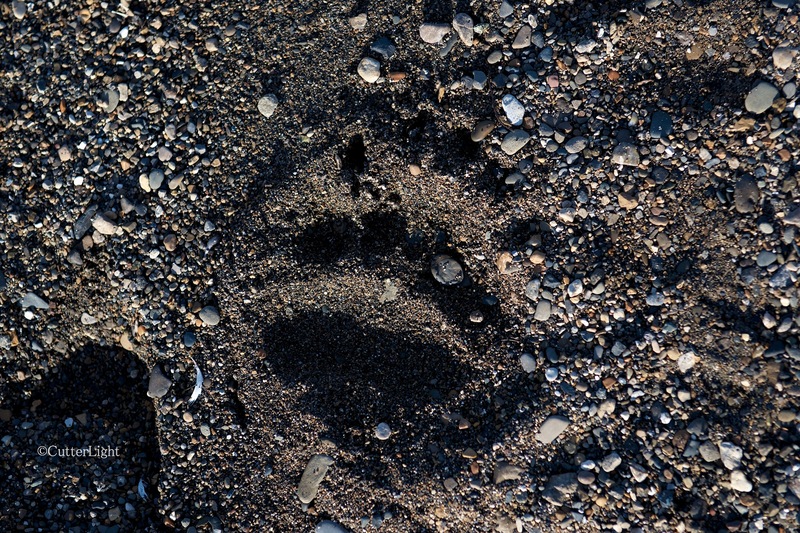 Brown bears (grizzlies) are common visitors to the beaches and tundra near Point Hope. We found a set of fresh tracks along the shores of an inlet off the Chukchi Sea not far from where we encountered the ptarmigan. Red foxes, Arctic foxes, Arctic ground squirrels, weasels and caribou are frequently seen mammals. Wolves and musk oxen are less common, but also figure in the mix. In the foothills and mountains east of Point Hope there are wolverines and at higher elevations, Dall sheep. Rarely, moose are seen in the scrub willows along the nearby Kukpuk River, and during the winter months polar bears show up both on the sea ice and on land. 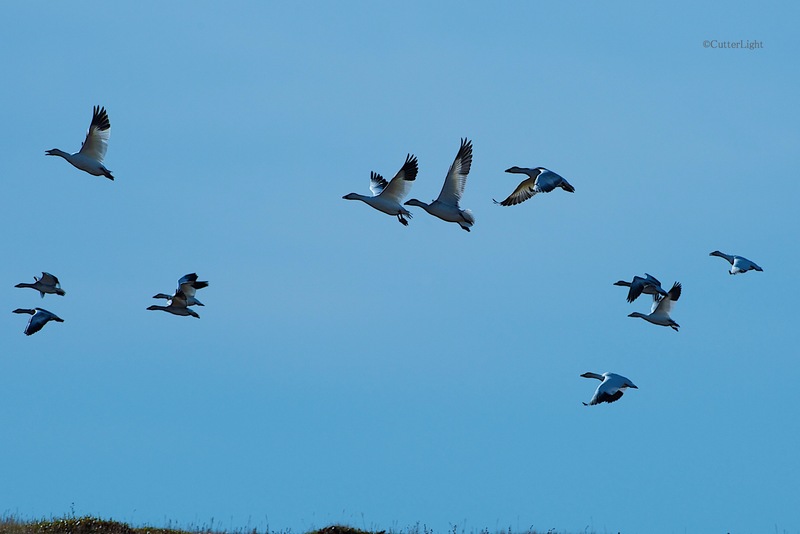 Brandt, Canada geese, and a wide variety of ducks and shore birds are also common. 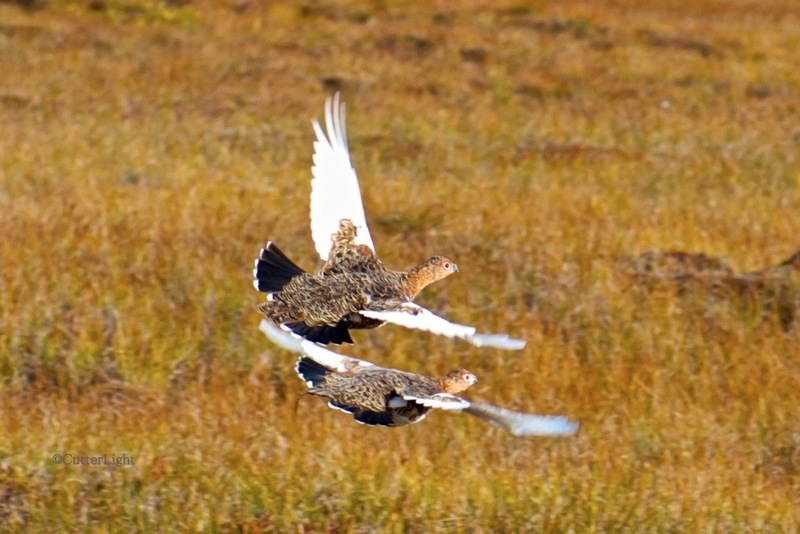 When the ptarmigan finally had enough of us, they glided off a few yards, regrouped and resumed feeding. At that point we turned for home. A handful of frozen sweetness for the road. 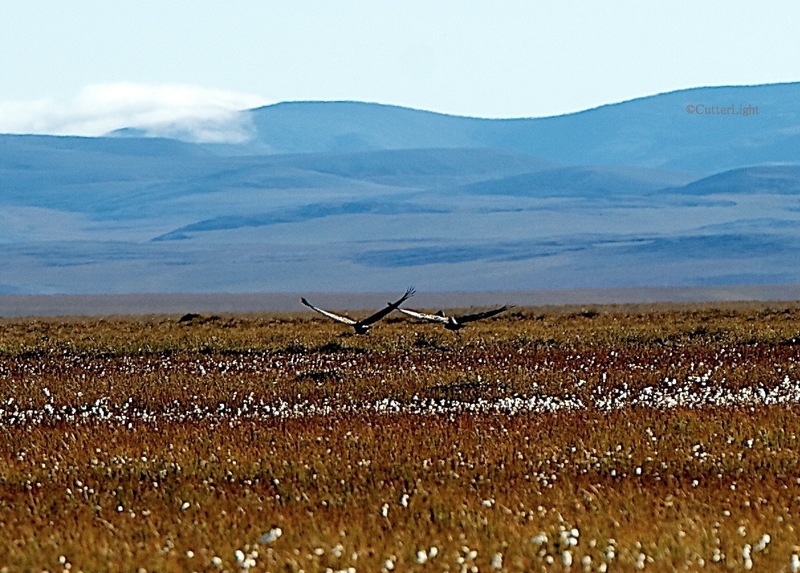 A pair of sandhill cranes lifts off above the last of the cotton grass on the tundra near Point Hope. With a brood of chicks waiting to be fed, this Arctic tern (Sterna paradisaea) hovers above the water in search of small fish, its primary food source. Minute control over individual tail and wing feathers enables terns to be graceful, formidable hunters as well as inspiring to watch. Making an annual round-trip of roughly 50,000 miles (80,000 km) between their breeding grounds in the Arctic and their summer feeding grounds in the Antarctic , Arctic terns are a species that fill one with awe and wonder. Unlike most of their cousins in the gull family, they are true seabirds as their migrations take them over vast oceans far from land. To stand on northern beach and watch terns fly is to watch an artist redefine the air. 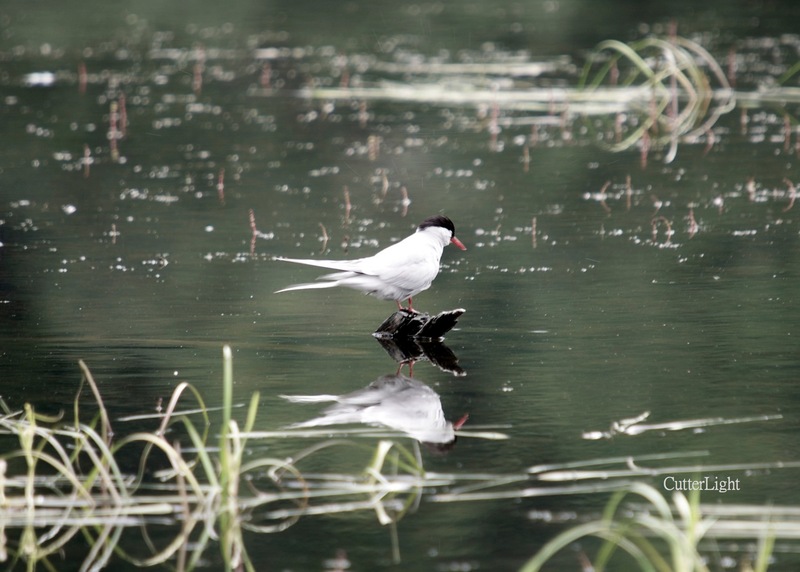 Breeding pairs mate for life and most terns return year after year to the same grounds where they were hatched. There they scratch out a shallow depression in the earth and lay one to three eggs (sometimes more) the size and color of large, brown-flecked olives. Approximately three weeks later the eggs hatch and three to four weeks after that the young birds are fledged. 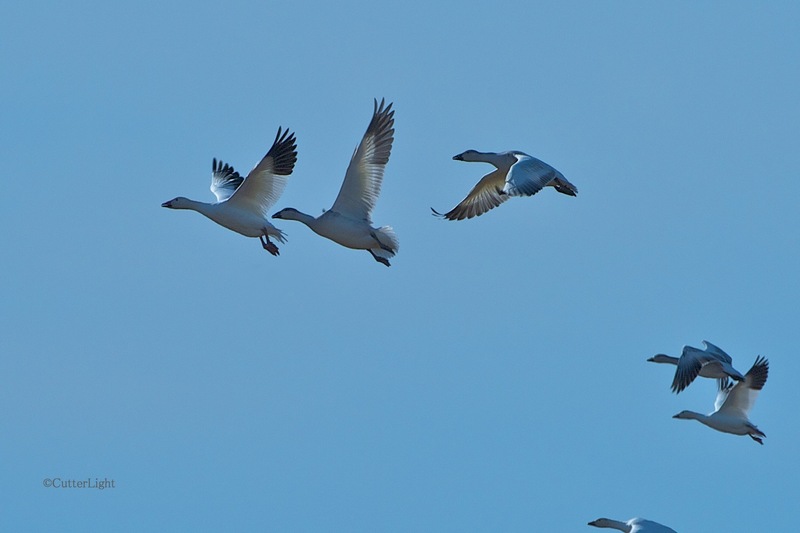 In fall, they will join their parents in making the longest migration of any bird species. Inky black eyes almost disappear into a jet black cap. Although their legs seem impossibly short, terns are fairly adept on land. 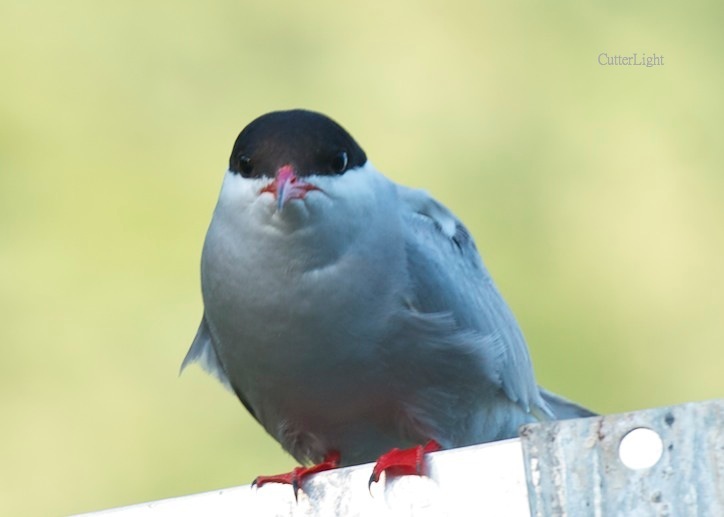 A specialized gland allows Arctic terns and other seabirds to extract the salt they ingest and expel it through their nasal cavities. Although one individual is reported to have lived to the advanced age of 34, the average lifespan of an Arctic tern is about 20 years. Their preferred nesting sites are on islands where they’re relatively safe from predators such as foxes and domestic cats, although they lose some eggs and young to gulls and other birds. 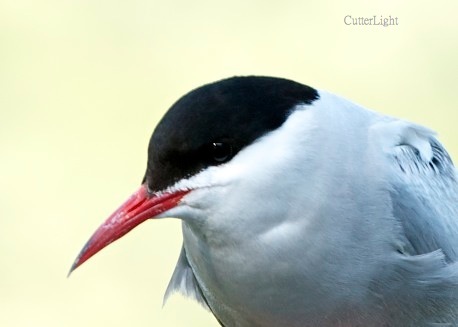 At one point the millinery trade took a heavy toll on tern populations, but in recent years the greatest threat appears to be decreasing food supplies due to human overfishing. 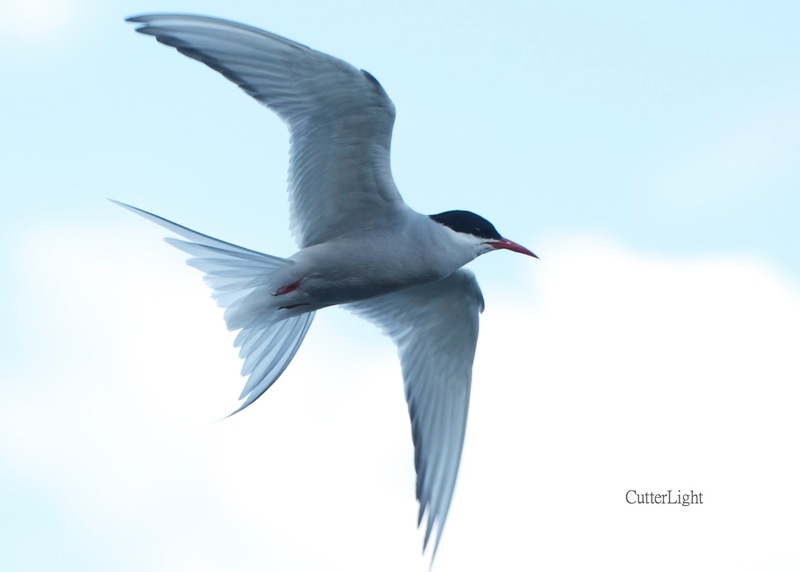 At present, there are estimated to be about one million Arctic terns worldwide. Above: An Arctic tern scans the water below for the tell-tale silvery flash of a school of small fish. 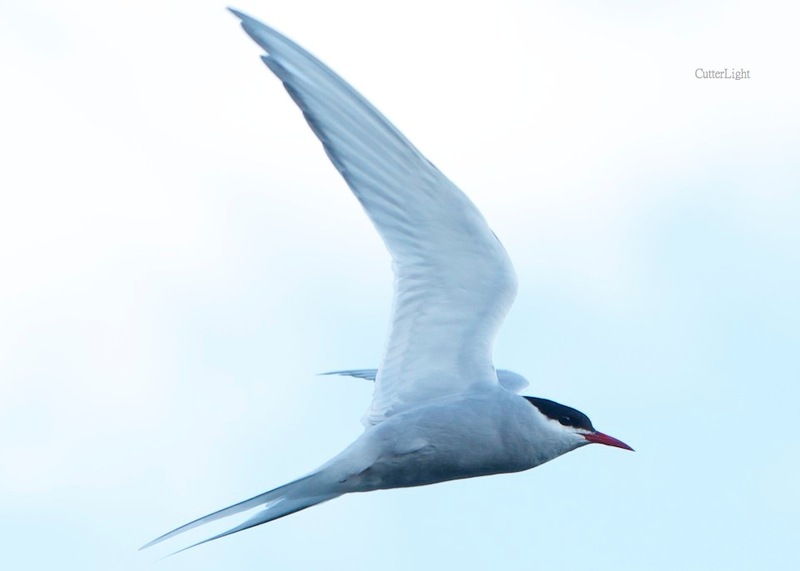 Often flying with a scissored tail and the ability to execute amazing aerial acrobatics – including backflips – account for the Arctic tern’s genus specific name paradisaea – paradise – reminiscent of birds of paradise. He’s probably not really looking at his own reflection, but with a snappy red bell and a handsome black cap like that, who could blame him if he is?